" Bonjour, ..as luck would have it I am currently working on the same subject for two different publishers - the famous Eastern Front Jagdgeschwader JG 54. I have just completed some sixty new JG 54 artworks, 32 of these to appear in Erik Mombeeck's « Luftwaffe Gallery Special » n°3 and 30 in a new volume in the Lela Presse "Units" series compiled by Philippe Saintes and entitled 'Eagles of the Green Heart' - only two of these profile artworks will appear in both volumes! Of course the approach adopted by these two volumes is totally different, aside from the fact that one is published in English and one in French ..I've sent through an example of one of my artworks - as you know JG 54 was known for the original and unusual schemes applied to its machines! " Part one of a new French-language history of Jagdgeschwader 54, one of the best-known fighter units of the Luftwaffe. 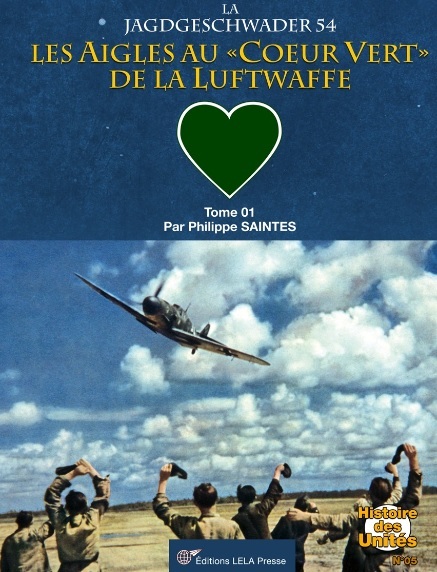 Philippe Saintes’ new history of this unit is illustrated with hundreds of photos (mostly rare and/or previously unpublished) and relates the struggles, successes and reverses of JG 54 during the first half of the Second World War when its pilots flew the Bf 109 exclusively. From first deployment against Poland in 1939 to the bloody duels with the Soviet air forces in the skies of Leningrad, including the combats on the Western Front during 1940, JG 54 (the 'Green Hearts') left its mark in European skies. Based on numerous first-hand accounts and documents (victory reports, stories taken from war diaries, loss lists) compiled over many years, the author reconstructs the history of this famous unit, which even today has remained largely unknown despite the presence in its ranks of many famous aces. 380 pages, more than 850 photos and 30 color profiles. Jagdgeschwader 54 - the Eagles of the Green Heart. Volume 1. Publication 20/12/2017 Author: Philippe SAINTES Edition: Units history 05 ISBN: Published in DECEMBER 2017. FREE SHIPPING on pre-orders up until October 2017! Pre-orders by cheque (French bank account – to be cashed on publication). For overseas orders payment is also possible by bank transfer, bank or credit card but in this instance payment will be debited on placement of the order. In June 1941, the Wehrmacht swept into Russia. Apparently caught by surprise, large numbers of out-moded machines in Russia's Air Force, the VVS, were destroyed on the ground and in the air. Alexander Yakovlev moved his design and manufacturing facilities east of the Ural Mountains and began production of the Yak-9 in 1942. Eventually some 16,800 Yak-9 models were built, more than any other aircraft in the Soviet Air Force. 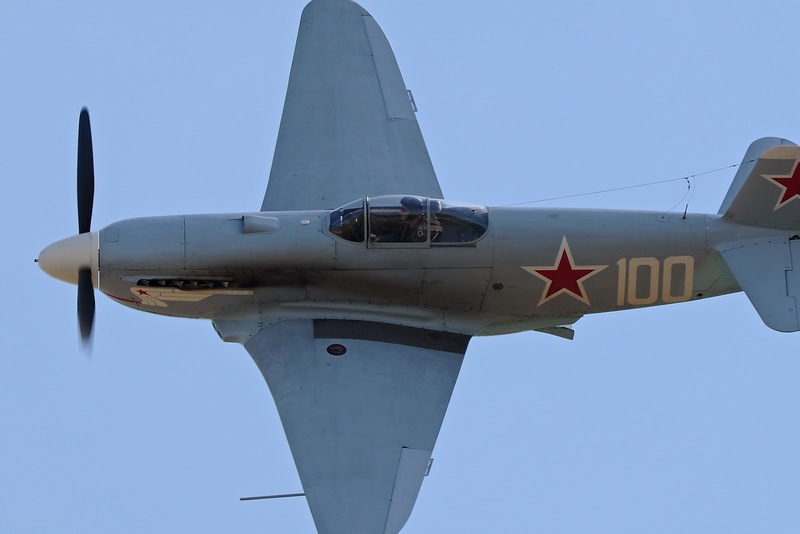 The Yak-9 was designed for mass production and durability. Due to shortages in Russia, it incorporated a minimum of scarce strategic materials. They were designed to outnumber the enemy, not for technical superiority. 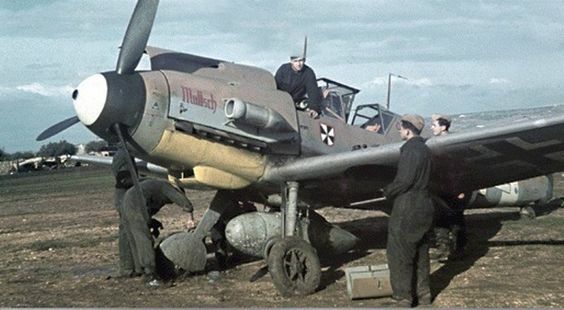 While not necessarily out-classing the Fw 190 or even the increasingly obsolescent Bf 109 in its early incarnations, Yakovlev's piston-engined fighters were good fighters in numbers, durable, maneuverable, fast, light, capable of absorbing a lot of battle damage and still getting home. The 'T' -tank-destroyer- variant armed with a 37mm cannon packed decent firepower. 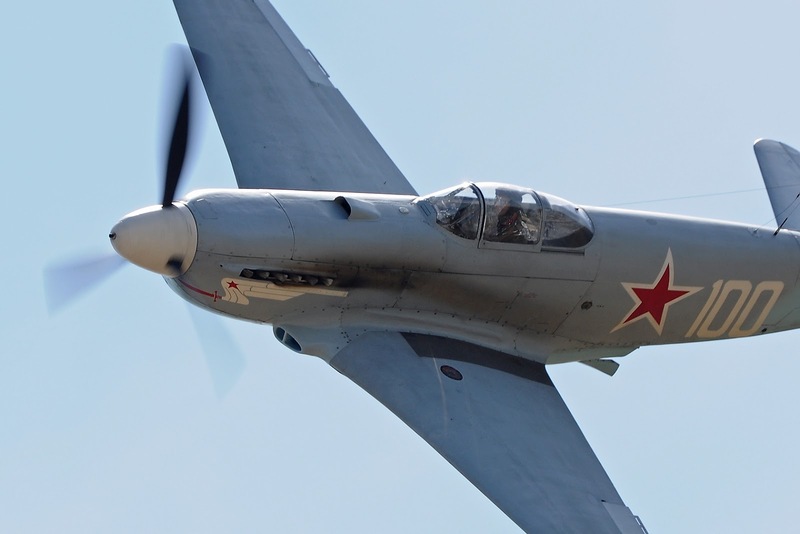 And appearing during the summer of 1944 the Yak 3 was one of the lightest, fastest most agile fighters of WW II - " perhaps only the Spitfire could rival this machine for manoeuvrability " according to Yefim Gordon and Dimitri Khazanov. 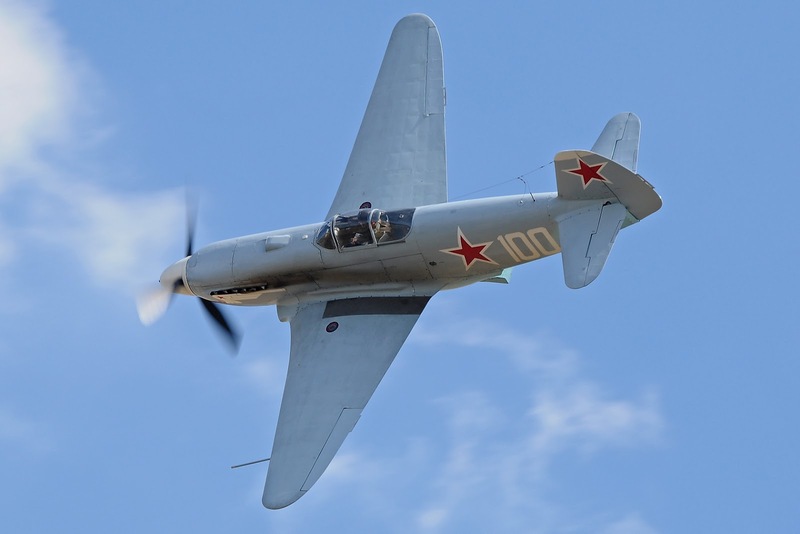 ".. the Yak 3 conferred a considerable advantage - the effect of surprise. Its silhouette was essentially the same as that of the previous versions of the Yak fighter, but its performance simply didn't compare. 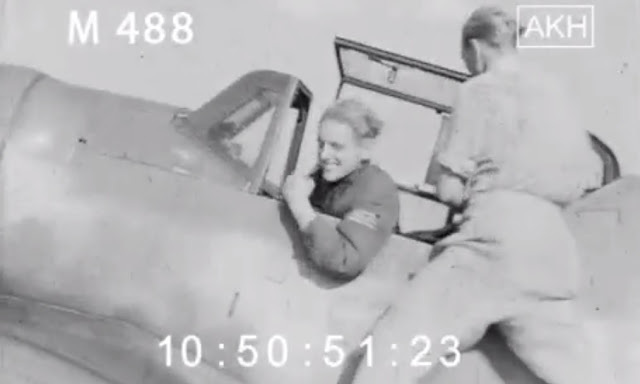 It could out-climb and out-turn the Fw 190 and caused some panic among the Luftwaffe pilots who had difficulty comprehending just what had suddenly happened to them.."
" ...pushing the throttle wide open, and tucked in alongside side each other, our flight of four Yak-3s accelerated down the track and were rapidly airborne. We didn't climb but stayed low. At more than 500 km/h our deadly excursion through West Prussia was underway - 40 minutes of hurdling trees, roads, and villages, leaving our ear-shattering calling cards - the awesome fireworks of four cannon and eight machine guns.."
" ..I start the display at 400 mph, maximum speed is 500 mph, although I haven't had it up to 500 mph yet ! Instructions to Luftwaffe pilots were - do not engage below 4,000 metres, the sort of heights at which the Yak 3 normally operated. It is lighter and just as powerful so will out-turn any contemporary. 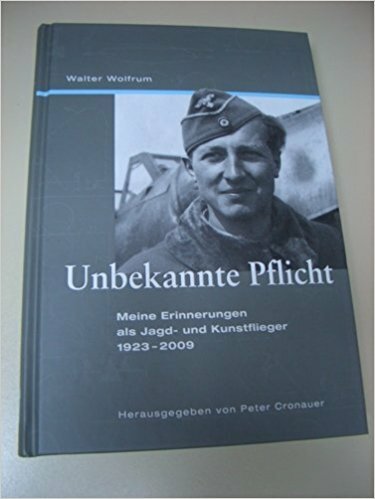 In a dogfight it will just get on your tail and shoot you down.."
Walter Wolfrum's memoir was entitled "Unbekannte Pflicht" co-written with Peter Cronauer and published by 296 Verlag. He recalled a confrontation with General Hans Seidemann Kommandierender General of VIII. Fliegerkorps (Generalleutnant from 1 January 1944) not over the qualities of the Yak-3 but over the type's very existence! "..Have you all gone mad? You and your Jak-3! There is no Jak-3! And certainly not in this section of the front! It is a fairy tale ("ein Ammenmärchen"), how often do I have to explain this?!? " Although I thought I knew him quite well, the General who had so often praised me for my 'extraordinary achievements in the air war' and who had visited me in hospital after my last serious wound, now gave me a terrible bawling out in front of his approvingly grinning staff officers ('machte mich zur Minna'). In unrestrained fashion the 42-year-old worked himself into a frenzy - we let ourselves be driven mad by the enemy propaganda, and had the audacity to spread it further, he roared. We were seeing ghosts and over-reacting. All that remained now was to charge me with cowardice before the enemy and make an example of me in front of my comrades..
....Perhaps they did actually believe what they were claiming - that we still had the best machines. But those days were long gone. 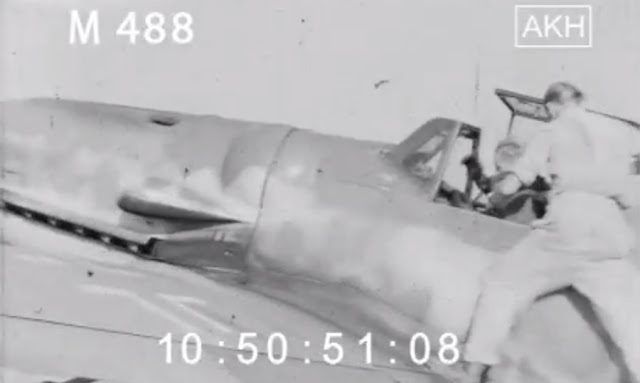 In the hands of an experienced pilot the Bf 109 could still be dangerous. But how many experienced pilots did we still have left? 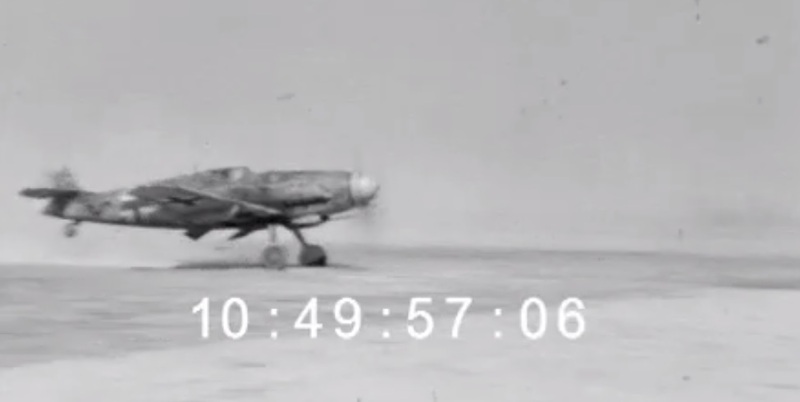 And by early 1945 the 109 was starting to get long in the tooth. It's development had reached its high point with the agile 'Friedrich'. Since then every planned upgrade and improvement was actually a step backwards. During the summer of 1944 I flew the G-6, in 1945 I flew the G-14, the G-10 and finally the K-4. The fuselage was strengthened, armament was increased and each time the engine had to be up-rated to compensate. But the DB engine had reached the end of its development potential. The latest variant, the DB 605 was essentially the same DB 601 that had powered the 109 at the outbreak of the war. While the engine had been overhauled it was very vulnerable and breakdowns and failures piled up. When we flew for just three or four minutes at full-throttle and with emergency power, the engine was finished. The average engine life under front conditions was in any case only around 40 hours....In addition, we had not made any decisive progress in the armament. The 30 mm cannon MK 108, which fired through the propeller hub of the Me 109, was on paper an absolutely lethal gun and appeared mainly suited to combating the ubiquitous Il-2, but the weapon tended to jam easily. It fired shells weighing 480 grams at a muzzle velocity of only 550 meters per second and at a rate of 660 rounds per minute. One could almost observe the trajectory of these heavy, slow projectiles falling away without ever reaching their target - unless you were at very close range. I preferred the old MG 151/20, despite its smaller caliber. You could shoot much more accurately with it .."
Signed photo of Oblt. Erwin Leykauf offered for sale on Ebay here. Leykauf is seen climbing down from his Bf 109 G-4 'Blue 1' of 12./JG 54 some time during April-May 1943 either in northern France or Belgium. Leykauf had been appointed Staffelkapitän in April 1943 and a few months later moved to 11./JG 54 in the newly established IV./JG 54. Leykauf survived the war with 33 confirmed victories, 27 of which were scored over the Russian front. In May 1940, he joined 2./JG 21 and shortly after on May 10, he scored his first victory. I./JG21 was re-designated III./JG 54 and Leykauf was posted to 7. Staffel with whom he flew during the Battle of Britain scoring 4 victories. 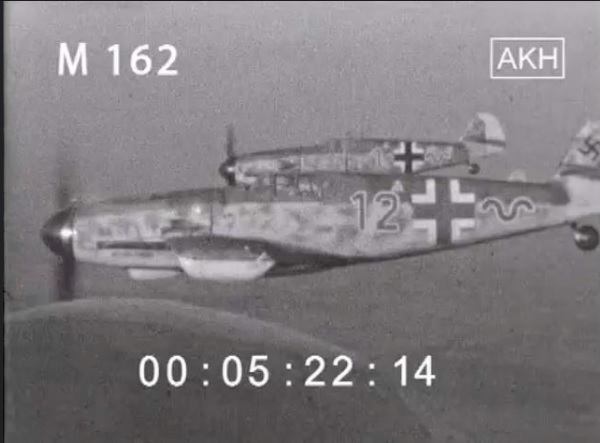 Below; Bf 109 G-6 with Gondelwaffen "Blue 12" and 'Blue 1' of 12./JG 54 seen in May 1943. Source: film compiled by Erwin Leykauf via archiv-akh.de. ".. He visited me in Paris in 1993. His recollections of life in I./JG 300 were very fragmentary. I even had to identify for him some of the various instruments that can be seen in the Bf 109 cockpit photo in his book. He also failed to recognise his Staffel comrade Bert Wendler in the 3. Staffel photos that I was able to show him such was his memory. Although in the end I did put the two of them back in contact. Jung knew his memory was poor and that was why I was asked to compile the brief history of JG 300 that appears in his book of war-time recollections that he self-published in 1993. His replies to my questions were on occasion rather disconcerting. The book itself is probably not really worth reading as history - Jung changed some names and left others, fortunately..."
13 September 1944 was a day of huge American aerial activity over Germany - well over 1,000 US bombers and hundreds of fighters were launched at various targets. It was 10:35 when the green flare signalling the order to take off rose into the sky over the airfield at Esperstedt. The Messerschmitt 109s of I./JG 300 took off behind the Bf 109 G 14/AS “double chevron” of Ritterkreuzträger Hptm. Gerd Stamp. Barely twenty aircraft, the last of Stamp’s machines that were combat ready. This small formation was vectored over the Halle-Leipzig sector where combat was engaged at about 11:40 with a small force of 357th FG Mustangs. At about 12:15 the Bf 109s of I./JG 300 closed on several boxes of B-17s between Eisenach and Coburg. Oblt. Manfred Dieterle, Kapitän of 2. Staffel, saw several strikes impact against a B-17 which veered out of formation trailing a thick plume of black smoke in its wake. At 12:50, Dieterle landed back at Esperstedt in his “Red 7”. After Gfr. Hans Dahmen (2. Staffel) and Fhr. Otto Leisner (1. Staffel) had each claimed a Boeing destroyed, the German pilots once again clashed with Mustangs of the 357th FG, now joined by P-51s of the 55th FG. After his Schwarm had been scattered, Jung's G-14 was chased by four Mustangs. In the dogfight that followed, one of the P 51s flew in front of him - a short burst from his three guns resulted only in the jamming of the engine-mounted cannon. Managing to get into a good position for a second time, Robert Jung unleashed a burst from his cowl machine guns and saw his rounds explode against a P-51’s wing, which appeared to catch fire. The Mustang rolled slowly inverted and went down vertically. Despite the proximity of the ground, Jung did not have time to observe his victim crash. 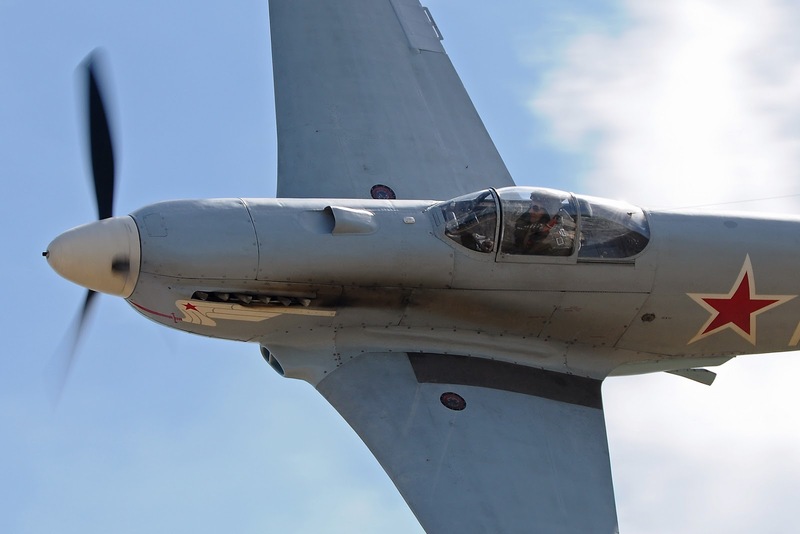 He himself had taken hits fired by one of his pursuers and had to attempt a dead stick landing, putting his “Yellow 3” down gear up in a field. 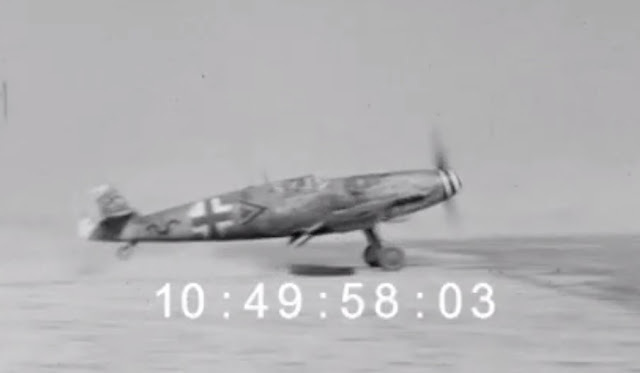 The Bf 109 G 14/AS flipped over as it struck the ground. The concussed pilot was pulled clear of the aircraft and transported to the nearest hospital. If a victory claim was filed, then it was not confirmed. For the historian of JG 300, Jean-Yves Lorant, "..Jung's book is still of interest for its sense of 'atmosphere' and 'feeling'. A shame his memory was so poor - had other veterans recalled as little then there is no way that I could have contemplated writing a history of JG 300! 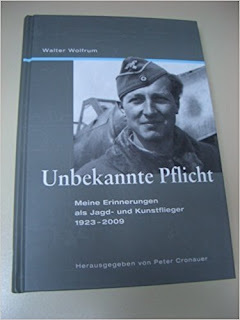 According to Bert Wendler who was very reliable and had a detailed Flugbuch and memories of his 3. Staffel comrades, Jung flew no more than a handful of sorties 7 or 8 at the most. Unfortunately I do not have any photos of Jung - he never did lend me the only photo he had of himself in Lederkombi as a Fj-Uffz in I./JG 300. Maybe he thought he wouldn't get it back or maybe he simply forgot to send it to me - whatever, I didn't press the matter. His wife told me she thought he had never got the original back from the camera/photo-shop that was supposed to be making copies. 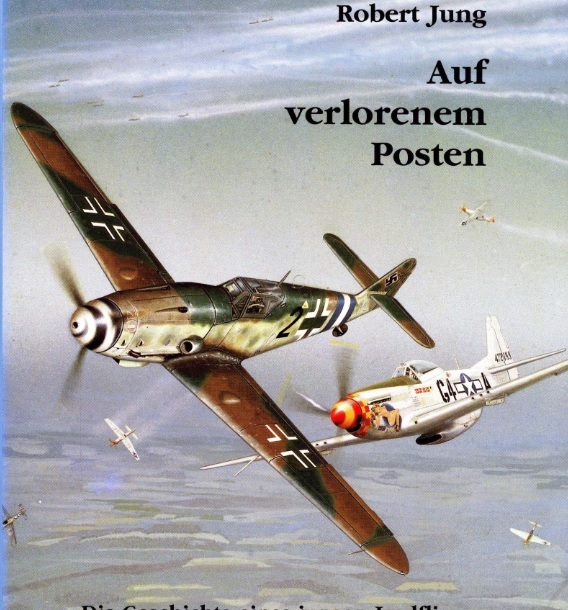 By the way the cover of his book was a composition painted by Richard Goyat depicting a I./JG 300 G-10 being pursued by a 357th FG P-51 on 14 January 1945..note the blue/white/blue fuselage bands introduced in JG 300 in late December 1944. Post-war he enjoyed a successful business career, eventually founding his own marketing company which he sold in 1988 .."
During the summer of 1944 the Third Reich was enduring colossal setbacks on both East and West fronts. After barely eight weeks of hard fighting, the Normandy front had collapsed with the Allies closing the Falaise Pocket - three Abteilungen (120 machines) of the vaunted Tiger and King Tiger tanks lost among much other materiel. Furthermore the Eastern front was seriously and rapidly contracting. The Soviets' launched their first major summer offensive -codenamed Bagration after a Georgian Tsarist marshall, a hero of the Napoleonic Wars - shortly after D-Day and threatened the total annihilation of the Ostheer's Army Group Centre. Hitler believed the blow would fall further south and Ritter von Greim's Luftflotte 6 covering Ernst Busch's central sector had available only one hundred ground attack aircraft and one hundred or so fighters, the bulk of his forces being outmoded bomber types. The offensive was launched on 22 June and the skies above Army Group Centre were reportedly thick with wave after wave of VVS machines. During July Operation Bagration virtually wiped out the most formidable assemblage of German military might. In addition there was the failed assassination attempt on Hitler! It has been suggested that Hartmann's exploits through the summer of 1944 were 'built-up' by German propaganda to counter the constant barrage of bad news from the fronts - both East and West. 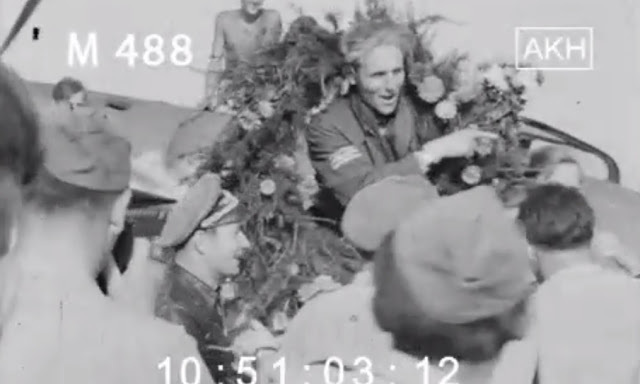 Hartmann had passed 250 victories in June over Romania and was fast approaching '300'. Below; Gruppenkommandeur Batz gets airborne on the 24th August 1944 from the forward landing ground south of Warsaw, flying off behind (presumably) his wingman at the controls of 'Yellow 12' also of III./ JG 52. Batz claimed his 200th on 17 August 1944. Above; Oblt. Fritz Obleser (in leather jacket! ), Staffelkapitän of 8./ JG 52, greets Hartmann on his successful return with the '300th' on the afternoon of 24 August 1944. 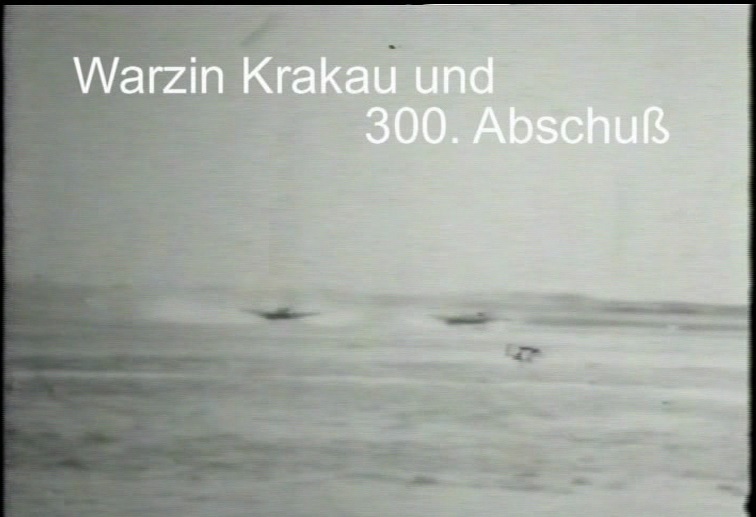 These stills were captured from footage made available via the Agentur Karl Höffkes film archive AKH and are reproduced here with the kind permission of Karl Höffkes. Oblt. 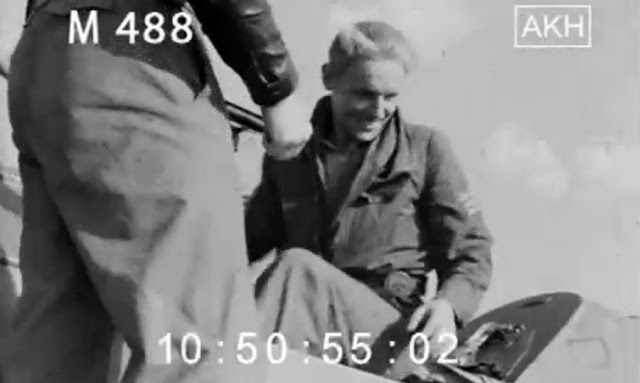 Rudolf Trenkel Staffelkapitän of 2./ JG 52 returned his 100th on 14 July 1944, while July saw Hartmann's former wingman and his successor as Staffelkapitän Fhj.Fw Hans-Joachim Birkner (9./JG 52) progress his victory tally to 88. Another Karaya Staffel pilot, 80-victory ace Lt. Herbert Bachnick, crashed to his death in East Prussia on 7 August 1944, his 'Yellow 4' shot down by P-51s escorting B-17s airborne from the Ukranian field of Mirogod. On 24 July Lublin fell and on 27 July Lemberg. The Kommandeur of I./ JG 52 Hptm. Alfred Borchers returned his 100th. Elsewhere Lt. Franz Schall of 3./ JG 52 claimed his 100th on 31 August 1944 in his 'gelbe 13', having shot down eleven on 26 August (victories no. 83 to 93) and returned no less than thirteen (13!) on 31 August. These exploits saw him posted back to Germany to the Erprobungskommando Nowotny. 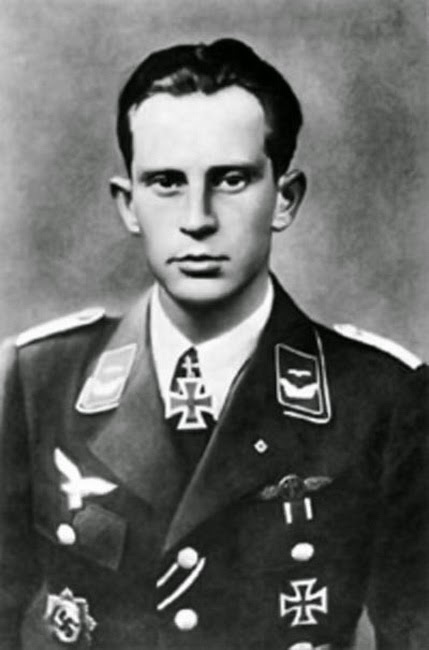 Lt. Anton Resch of 3./JG 52 returned seven victories on 26 August 1944 to take his score to 44. Oblt. 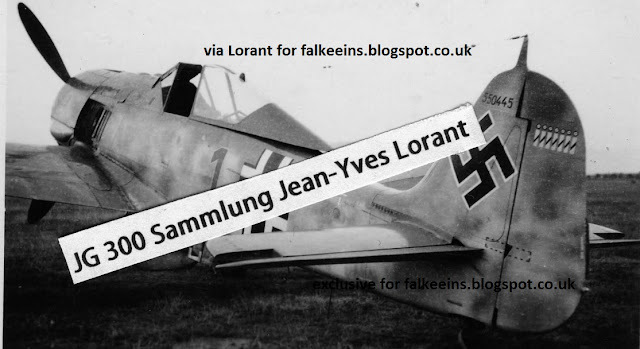 Otto Fönnekold (136 v) was killed..
'FalkeEins - The Luftwaffe blog' presents another blog exclusive -albeit heavily copyright marked to deter the usual photo-thieves - this very rare image from the collection of JG 300 historian Jean-Yves Lorant. This is Focke Wulf Fw 190 A-6 'Grüne 1' Werk Nr 550 445 flown by Oberstleutnant Hajo Herrmann and photographed between 03 August 1943 -date of Herrmann's 7th and last wilde Sau victory- and 24 August 1943 when Herrmann was shot down in this aircraft and bailed out 'unverletzt' (uninjured) according to the loss record. Click on the image to view large. The original photo -measuring just a couple of centimetres square- was in the possession of Stab./JG 300 mechanic Feldwebel Alfred Rademacher for much of his life. It was though in fact retrieved from the dustbin by the author Jean-Yves Lorant who just happened to be visiting Rademacher's widow Gerda as she was disposing of her recently deceased husband's personal effects! In his 'wilde Sau' article recently published in issue 60 of Aérojournal magazine, C. Ehrengardt attempts to reinforce two 'myths' concerning Herrmann's aircraft and his wilde Sau victory tally. 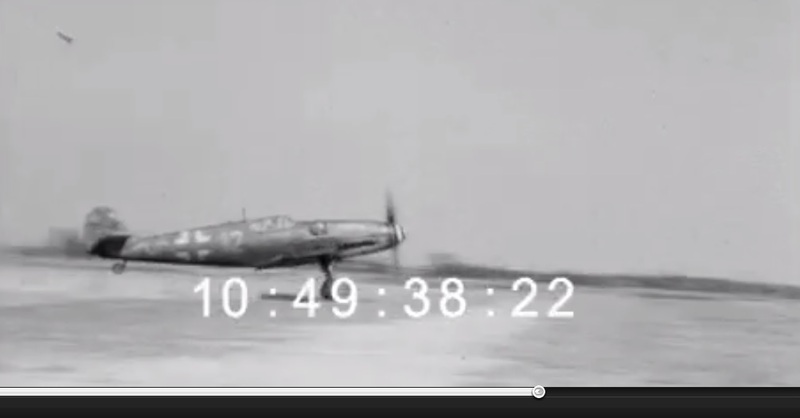 Firstly, that Herrmann flew a Bf 109 T on the Berlin raid of 23-24 August 1943 - he did not. 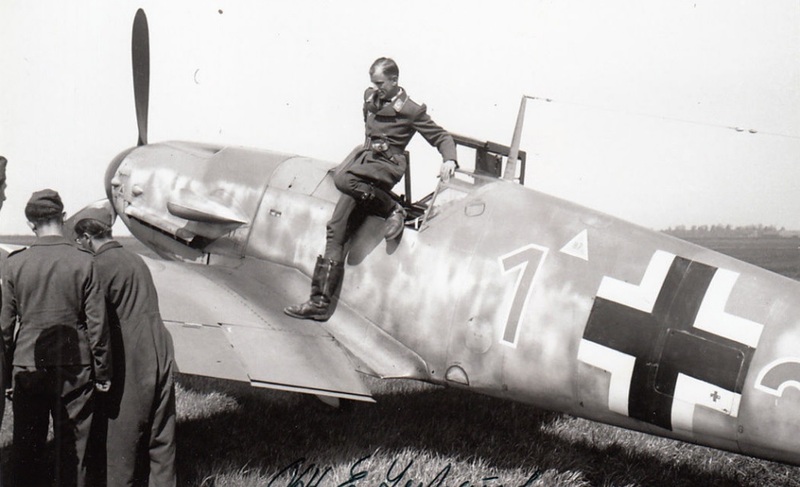 The author of the JG 300 history located the relevant loss listing during his research - '100% Fw 190 A-6 WNr 550445' - for the night of 23- 24 August, the pilot being listed as 'unverletzt'. This evidence, along with that of the photo presented above and Herrmann's own account of being shot down that night (he took to his chute and came down in one of the many lakes in the Berlin area) was more than enough evidence to remove any doubt. Below; just to clear up any 'misunderstanding' the inscription appearing on the reverse of the original photo above reads "Bonn 1943, August, Maschine von Obstlt Herrmann ". Even as recently as April 2017 it was still possible to find the less-than-knowledgeable posting images of the horrendous caricature artwork of Herrmann's machine that has been doing the rounds of out-of-date books, articles and internet pages since the mid-1960s!! Take a (very) quick look here for example. Posting out-dated caricature profile artworks with hopelessly incorrect captions - rather like attempting to revise and refute certain facts diligently proven by a recognised authority - doesn't do much for your credibility I'm afraid. - claimed by the Flak who 'appropriated' a certain 'quota' of shot-down bombers according to the number of shells fired. 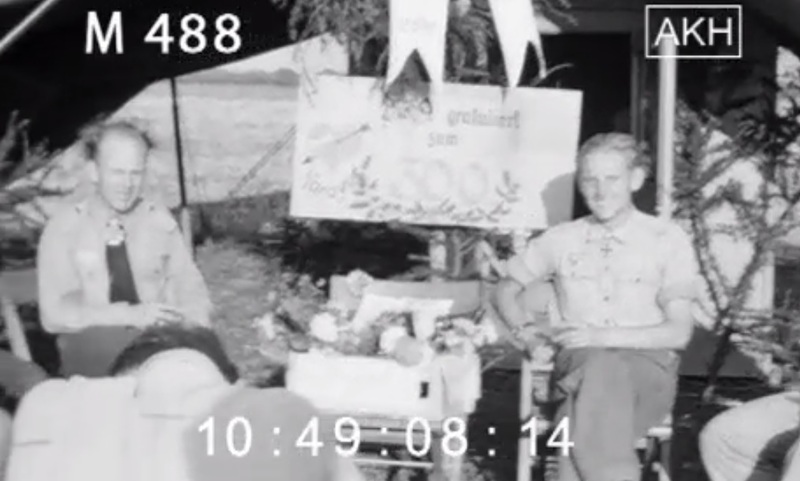 - simple lack of diligence : by way of example the log-book of leading wilde Sau ace "Nasen-Müller" details only FIVE of his thirty night victories. Hence the importance of locating primary source documents or photos or accounts which enable the reality of what happened on wilde Sau operations to be painstakingly reconstructed. Page 48, top. "Leutnant Reinhard Krumbach" is an invention of Bobo and his jg300.de site - evidently an inspiration and source for M. Ehrengardt. This 'pilot' did not exist on any JG 300 flight roster! "Black 3" as illustrated was indeed a III./ JG 300 aircraft but it was assigned to Lt. Otto Schwamb of 7.Staffel and was an ex III./JG 54 machine, retaining this unit's BLUE fuselage band and black Gruppe Balken. III./JG 300 aircraft never displayed a vertical Gruppe bar - as readers of Jean-Yves Lorant's JG 300 history would know. For some reason - an inscription on the reverse of a photo of Schwamb - Bobo at jg300.de has misidentified this photo as he likewise did with Kurt Gabler's machine . Either that or he doesn't read English particularly well! 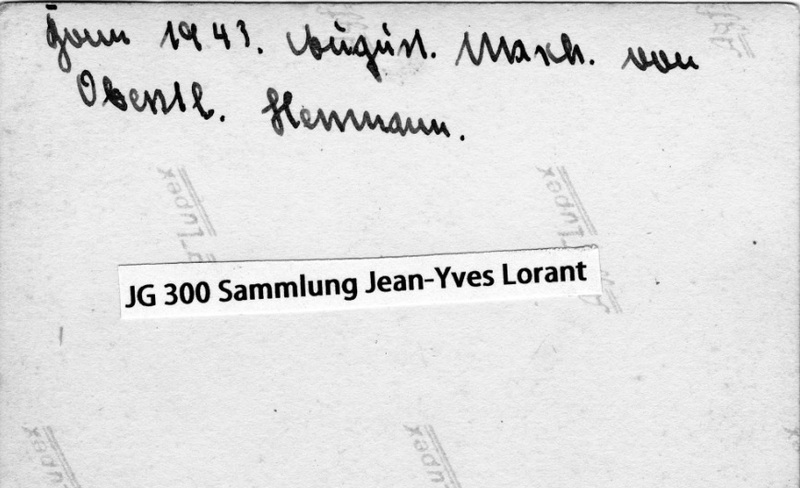 Page 51 top; now that the original photo on which the profile of "White 4" is based is in the possession of JG 300 authority Jean-Yves Lorant we can confirm that it is not a G-5 but a G-6 (the Werk Nummer is clearly visible). Assigned to I./JG 300 it was a 'Moskito' hunter painted in overall pale grey-blue equipped with power-boost as described by Herbert Schlüter in the JG 300 history (Vol I). It was not equipped with an 'infra-red' detector. Obviously to stand any chance of catching a 'Moskito' the aircraft did NOT mount 20mm Gondelwaffen slung under the wings. The pilot of this machine was a well-known ace of 1./JG 300. See more here on this blog. ".. 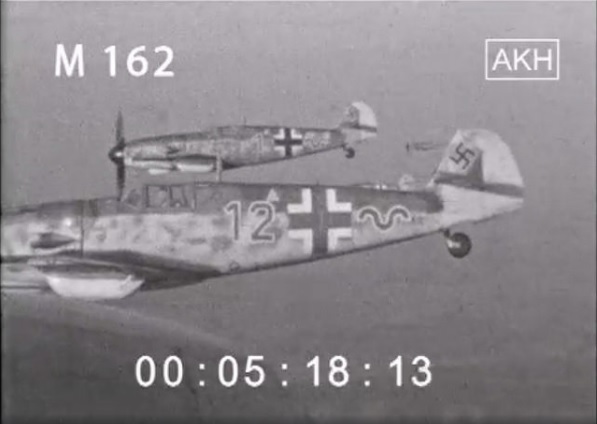 Even as defeat appeared imminent, he refused to countenance any concessions to the enemies of National Socialism, vehemently rejecting an idea, floated by the Luftwaffe High Command, that the remnant of the air force should join with approaching American forces and fight alongside them against the Russians. Having fought throughout the war almost entirely against the western Allies, Herrmann was taken prisoner by the Russians on May 11 1945. He spent 10 years in Soviet camps and was one of the last to be released, returning to Germany on October 12 1955. After a period studying law Herrmann opened a legal practice in Düsseldorf in 1965. His clients included Holocaust deniers such as Otto Ernst Remer, Fred A Leuchter and David Irving. Something of an idol to the far-Right, he held political and historical evenings all over Europe to tell a younger generation what it meant to "live for the cause". He continued to make public appearances until 2009. For his services to the Third Reich, Herrmann was awarded the Knight's Cross, Oak Leaves and Swords..."